Two versions of the MTA subway map found on the authority's website. One represents the Cortlandt Street R/W as closed with a gray dot. In another version, it appears to be in operation. (Courtesy MTA). It may not have a marquee name attached to it, but work on the Cortlandt Street R/W subway station is another sign of the slow but increasingly steady progress at the World Trade Center site. Closed since 9/11, the heavily damaged station has stood as an eerie reminder of that day, visible to the thousands of riders that pass by it everyday as the trains creak and twist toward Rector Street. A gray dot on the MTA subway map represent the station’s there-but-not-there quality. The Cortlandt Street 1 train station is also marked with a gray dot. The words “World Trade Center Site” hover over the map in an even lighter shade. Recently, workers on the northbound R/W train platform have been laying concrete block and setting sparkling white tiles. It looks much like any other station undergoing refurbishment. 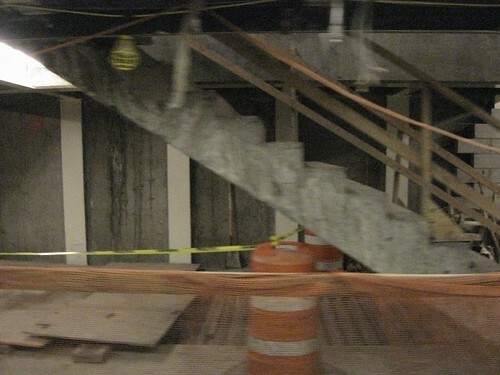 According to a spokesman for the MTA, the northbound platform will reopen in December 2009. It’s a small workaday step toward reintegrating the site into the city fabric, but it also illustrates its complexities involved in construction there. A timeline for the reopening of the southbound platform is being developed. The entire 1 train station will remain closed until an unspecified date, according to the spokesman. To reopen the other platform and the additional station, issues of collaboration, permissions, and access must be resolved between the MTA and the Port Authority. The MTA will alter all the subway maps to reflect the reopening of the northbound platform. UPDATE: The MTA sent this statement clarifying when and why the station was closed. 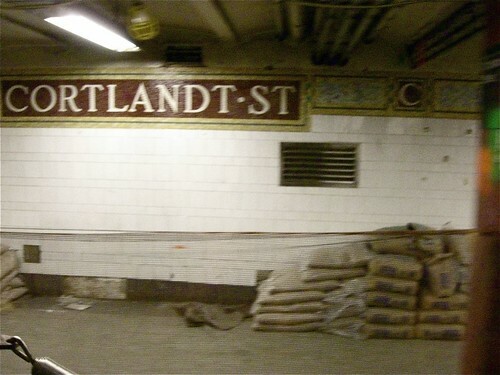 Following the events of September 11, 2001, the Cortlandt Street R/W Station was reopened on September 15, 2002. 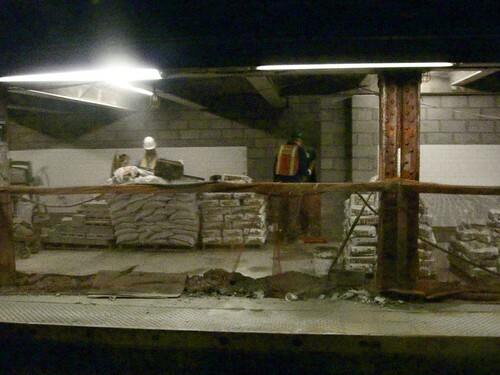 The station was closed again on August 20, 2005, to accommodate excavation and construction of the Dey Street underground pedestrian concourse, a component of the MTA’s Fulton Street Transit Center project. The concourse will create direct passage between the Fulton Street/Broadway-Nassau subway station platforms, the R & W platforms, the World Trade Center site and its PATH station. The work building the concourse has been completed, but the Cortlandt Street station has remained closed because of a slight settlement that has occurred to the platforms as a result of work being done to rebuild the adjacent World Trade Center site. This settlement is detectable by engineering instruments, but does not significantly affect the overall structural soundness of the station and has not impacted train traffic through the station. Station opening requires that the settlement be repaired, which has been partially completed but requires further work, and that the station finishes and necessary stair and passageway work be completed.